Hello! I recently noticed this incredibly gorgeous card from Donna Mikasa, and was inspired to try the watercolor technique she used. She was inspired by Joni Andaya, who made another drop-dead gorgeous card and even shared a video tutorial on this fun technique! So a big thank you to both of these ladies, I had a ton of fun making this card, inspired by them! I just used some cheap watercolor paints from Michael's. I'm talking $7.99-plus-a-40%-off-coupon cheap! I love it when fun techniques can happen with little money leaving my pocket, LOL! I followed the technique Joni shared - but I added more and more paint, I couldn't stop myself! So my flowers aren't quite as delicate and beautiful as hers were. But I still like them! I finished the card with one of my favorite older sentiments from Hero Arts, die cut with a frame. The Kraft and Azure papers are from Hero too, as well as the Cornflower ink. 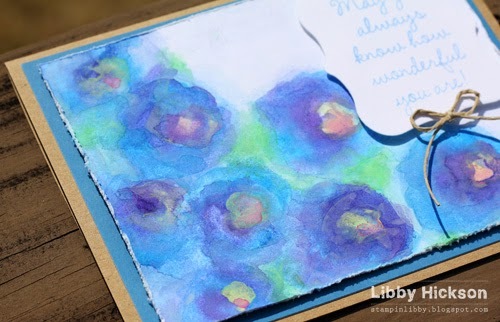 First of all, thank you for linking up your beautiful card to the water-color challenge, Libby! Your coloring reminded me the water lilis from Monet's painting! The colors are absolutely GORGEOUS! I am glad that little "investment" at Michael's is worth every penny! You definitely should play more with water-colors! 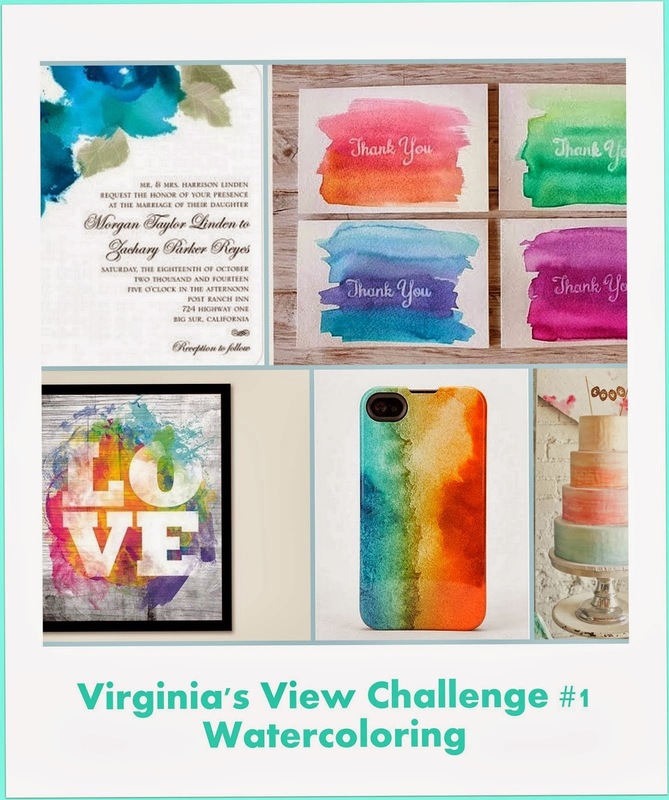 I bet Courtney would love to try her hands on it ;) So glad that you join the fun with the first Virginia's View Challenge! You did great on this watercolor technique ! Beautiful card ! Beautiful, Libby! I so wish there were roses this color! I've been meaning to try this technique, too - will try to have a go of it tomorrow; thanks for the inspiration! Libby I think you did a beautiful job of painting these flower....gorgeous vibrant colours too. Love this so much Libby!!! And Virginia is right, it *does* look like Monet!!!! Love those flowers Libby - must go have a look!! The wee bow is the perfect embellishment! Thanks for the links. Libby, this is soooo gorgeous! Made me think of peacock colors! Absolutely gorgeous, Libby! Yours is my favorite, but, perhaps, it's the color. I will definitely try this rather simple technique with brilliant results! Thanks for the inspiration, my friend!